Air New Zealand is entering FY2015 on a high note. It starts the year having delivered what management expects will be an annual profit in the year to 30-Jun-2014 in excess of NZD300 million (USD262 million), the largest profit for Air NZ in a decade. Although not large in global terms, it should be seen in perspective; Air NZ is a small airline. But despite all the difficulties faced by a small airline at the end of the line, small can be beautiful: the projected profit represents a return on equity in excess of 15% - up from the 11% return anticipated by the market was expecting at the start of CY2014. Although predictions can be dangerous in a turbulent industry, Air NZ is poised for earnings growth as it moves from five fleet types to two, implements capacity growth and makes a number of other improvements. Since the FAA and EASA certified the 787-9 on 16-Jun-2014, Air NZ can now prepare to receive its first of type (for which it is the launch customer) and plan network improvements with the much-awaited aircraft. It is an early birthday gift as Air NZ will mark its 75th anniversary in FY2015. Air New Zealand at its Jun-2014 investor day confirmed it expects to post a profit in excess of NZD300 million (USD262 million) for FY2014, representing at least 17% growth from FY2013. 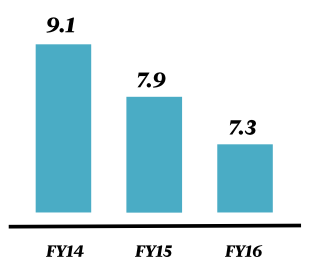 FY2013's profit was more than double that of FY2012. 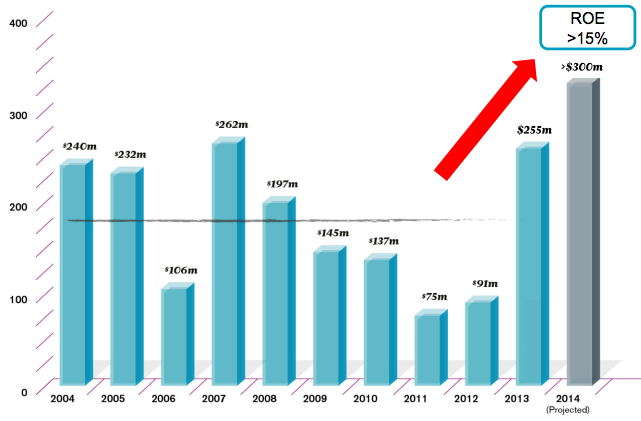 Air NZ for FY2014 will likely post a profit greater than the accumulated profit over three years from FY2010 to FY2012. Although this profit is small in comparison to profits being posted by global behemoths, Air NZ is considerably smaller. Air NZ's profit projection represents at least a 15% return on equity, one of the highest rates in the airline industry. Air NZ is one of only four airlines in the world with an investment grade rating. The big development in FY2015 for Air NZ will be its delivery of the 787-9. On 16-Jun-2014, the US FAA and Europe's EASA certified this stretched variant of the 787. Air NZ is the launch customer for the 787-9 and is due to receive its first of 10 of the type in Jul-2014. Air NZ has not ordered the more common 787-8. Depending on exact date of entry into service, Air NZ could be the first airline to take delivery of the -9 but only the second to place it into service (All Nippon Airways may be the first). 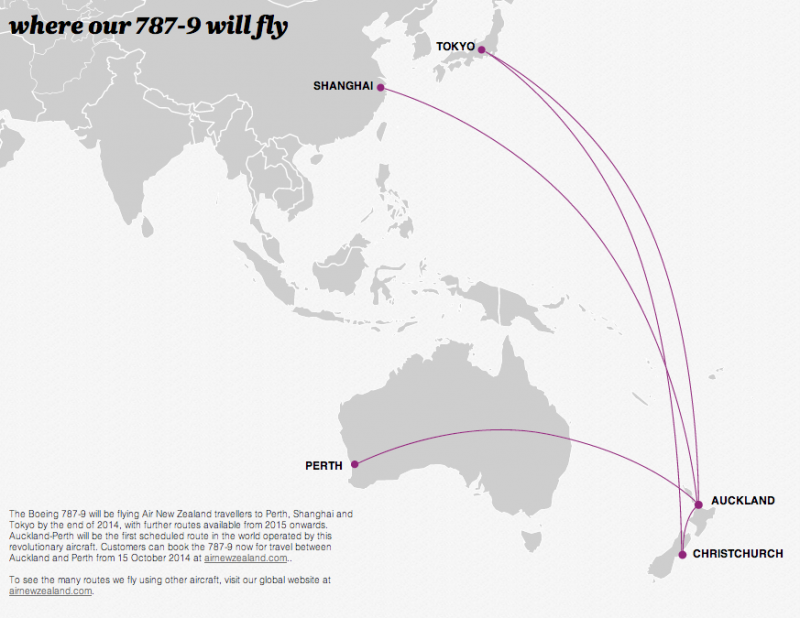 Air NZ expects Auckland-Perth to be its first 787-9 route, a service currently operated by 777-200ERs. Shanghai Pudong (served from Auckland) and Tokyo Narita (served from Auckland and Christchurch) are also due to receive 787-9 service by the end of calendar year 2014; the routes are currently operated by a mixture of 777-200ERs and 767-300s. The 787-9 will give Air NZ a consistent (and updated) product to the two destinations as well as facilitating capacity right-sizing. Auckland-Christchurch will also see some 787-9 services. Air NZ expected to receive its first 787-9 in Jul-2014, early in its FY2015, but Air NZ's investor presentation indicates it will receive one of the type before 30-Jun-2014, and then two more in FY2015. FY2015 will also see the delivery of four A320s, three ATR72-600s and one 777-300ER. 787-9 deliveries run through FY2018. Firm orders include those placed directly by the operator and by lessors assigned to the operator, from 16-Jun-2014 onwards. The 787 brings important simplification, with associated cost impacts, for Air NZ. Air NZ expects to reduce 2014's five pilot groups to two in 2016; the 747-400, 767-300 and 737-300 pilot groups will be phased out, leaving Air NZ with two jet engine pilot groups: widebody (777/787, which share commonality) and narrowbody (A320). The retirement of older aircraft will also enable Air NZ to reduce its average fleet age from 9.1 years in FY2014 to 7.3 years in FY2016. Air NZ has already gained efficiencies with the 777-300ER being 11% more efficient than the 747-400s it replaced, while the 787 will be 19% more efficient than 767s. Air NZ's ongoing replacement of 737s with A320s will deliver a 28% increase in efficiency while a later replacement of A320ceos with A320neos will deliver a 15% increase in efficiency, according to Air NZ. Air NZ in FY2014 took delivery of a leased 777-300ER and expects to take delivery of another in FY2015. The 777-300ERs serve trans-Pacific routes and the continuation flight beyond Los Angeles to London Heathrow. 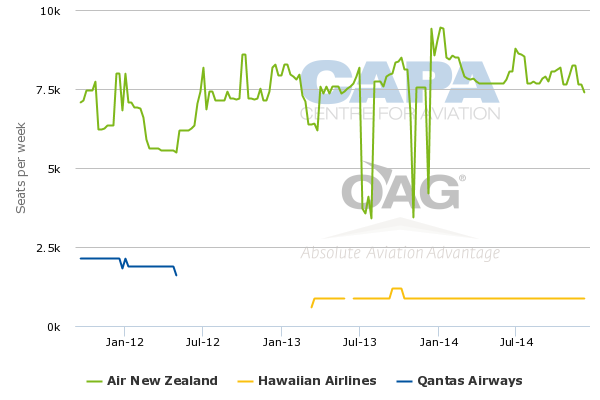 The 777s are facilitating further long-haul growth, with Air NZ for the week of 16-Jun-2014 having approximately 5% more seats to the United States. It is the international market that has captured much of the attention in recent years as Air NZ sought to restore and then improve profitability. But it is Air NZ's domestic market that is the tidy performer, and here the carrier expects further growth - although Air NZ has not quantified the exact amount. In the first three months of calendar 2014, domestic RPKs were up 4-5%. Air NZ's domestic jet network is mostly operated by A320s and the airline reports solid growth in these markets. Air NZ reports demand in regional markets as growing "steadily" and expects to increase capacity by using larger aircraft, namely the ATR 72-600. Meanwhile the Bombardier Q300 has a 47% lower CASK than the Beech 1900D. The next two years will see large fleet replacement at Air NZ, and the carrier expects this to increase its low gearing although Air NZ wants to stay within a 45-55% range. Ownership is the most common funding option for Air NZ's widebodies and especially turboprops, while operating leases account for almost two-thirds of Air NZ's narrowbody fleet. Air NZ still awaits regulatory clearance from the New Zealand authorities for its proposed alliance with Singapore Airlines. Singapore has approved the alliance while New Zealand approval is expected within a few weeks. Under the alliance Air NZ will re-launch services to Singapore Changi to enable connections on SIA and its SilkAir subsidiary to Southeast Asia, South Asia and Europe. Air NZ expects the new SIA partnership to open up 50 destinations. North Asia, including China, is covered by an existing alliance with Cathay Pacific, which the two parties describe as performing well (they have a monopoly in the Hong Kong-New Zealand market). Air NZ also has a limited partnership in Japan with fellow Star Alliance carrier All Nippon Airways. The two Asian alliances (approved/proposed) follow Air NZ's more mature partnership with Virgin Australia in the trans-Tasman Australia-New Zealand market. 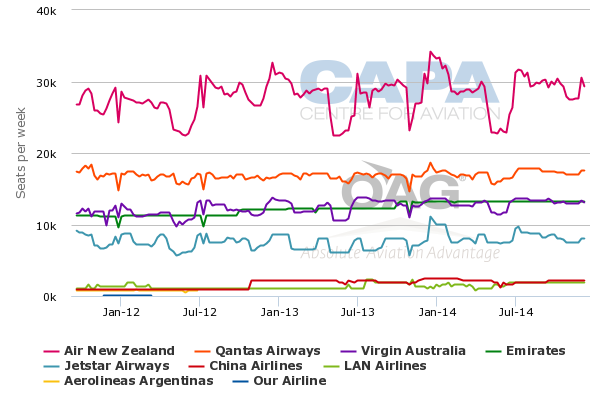 Air NZ, the single largest carrier in the market, continues to make incremental capacity gains while Virgin Australia, the third or fourth largest carrier depending on the week, has experienced more flat performance since increasing capacity in Jul-2012. Air NZ in Jun-2014 increased its stake in Virgin Australia to 25.99%, the maximum allowed under ASX rules. Air NZ retains its viewpoint that a stake in Virgin Australia delivers earnings potential and guarantees exposure to the larger Australian market. Esatablishing a position in the Australian market has been a consistent goal for the New Zealand flag carrier; it briefly owned Ansett Airlines, Australia's second airline before its collapse in Sep-2001. Air NZ CEO Christopher Luxon will shortly take a seat on Virgin Australia's board, joining Etihad Airways CEO James Hogan and Singapore Airlines CEO Goh Choon Phong. Mr Luxon has represented the three airlines as having a common goal for Virgin, but Air NZ and SIA are expected to be closer to each other than Etihad. How this relationship plays out will be closely watched. Air NZ enters FY2015 – and its the year of its 75th anniversary – in one of the best positions for any airline. This was not always the case; following the collapse of the much larger Ansett, Air NZ had to be renationalised to secure its survival. It remains majority owned by the New Zealand government and a further sell-down of the listed airline is frequently mooted. An exemplary turnaround was achieved by former CEO Rob Fyfe, whom Mr Luxon replaced in 2013. While Mr Luxon entered Air NZ on a high note, he has been able to take the carrier further through improved financial performance and some growth, which will soon increase. Re-fleeting will deliver further efficiencies and allow Air NZ to fill outstanding gaps in its network, and then grow. Risks are largely confined to any change (albeit not expected) in New Zealand's inbound market, which continues to be both Air NZ's and the country's defining goal. Air NZ appears to be moving to a solid position all round, from financial to fleet to passenger experience. As a small, end of the line, airline whose existence depends on a combination of its country's attractiveness to foreign tourists and the market's limited attention from major carriers - each of which is beyond Air NZ's control - the flag carrier will need to maintain its versatility. Exploiting that versatility (for example with its social media strategy and massively widely viewed inflight safety announcements which have been key to its disproportionately large global profile) will be key to continuing success. For now, the airline is showing every sign of continuing along that course.